Has the Irish Left missed the boat? An article in the ‘Village’ magazine presents the argument that the Left has missed the opportunity to translate widespread opposition to water charges into a significant challenge to the status quo in the coming general election. As a hard fact that must be faced, the author of it notes that it’s now possible to imagine not only a Fine Gael and Fianna Fail coalition but even the re-election of a Fine Gael/Labour Party Government. What a kick in the teeth that would be! Rather like the re-election of the Tories in Britain. “It’s time for some serious self-criticism” he says. The conclusion drawn, although it remains totally unexplored, is that the people “have found the alternatives unconvincing.” That is, they have found the left alternative unconvincing. It’s not clear to me from the argument of the article that many ever did but I’m not going to go very far in this post in looking at this either. Instead I want to reflect on the response that the article has evinced from the Socialist Party TD Paul Murphy. While there appears to be a debate here the grounds of it are very narrow indeed. In his call for self-criticism Ronan Burtenshaw first points to opinion polls which showed a rise in support for independents during 2014, from 18% or 22% (depending on the poll) to 32% and 30%. Support for the two established right-wing parties on the other hand had fallen from 30%/28% and 22%/22% for Fine Gael and Fianna Fail respectively to 19%/21% and 21%/19%. The second part of this explanation is part-admission of Burtenshaw’s case – his argument that the alternative was not convincing might be seen as just another way of saying that there was no sufficiently authoritative force to consolidate gains. Of course what Paul Murphy is arguing is that if the forces arguing for the left alternative were bigger its alternative would have been accepted by more people and there is nothing inherently unpersuasive about the left alternative. But this leaves aside the problem why the left was not bigger and why its argument, if it was persuasive, did not lead to further growth than it did, or rather did not allow growth to be maintained. If it was persuasive would it not also have been authoritative and, if authoritative is a euphemism for being bigger, how did being persuasive not lead to this increased size? Paul Murphy argues that Burtenshaw’s case has two flaws, the first of which is that it ignores the temporary impact on the popularity of the governing parties of victory in the referendum on marriage equality. He says that this allowed the Labour Party in particular “to wrap itself in a rainbow flag and present itself as socially progressive . . . I think much of that can be reversed as people are reminded by the real role of the Labour Party”, which includes further privatisation of Aer Lingus. By the way, Murphy accuses Burtenshaw of ‘confirmation bias’. That is the tendency to interpret new evidence as confirmation of one’s existing beliefs or theories. But Murphy is guilty of this himself, no more obvious than when he dismisses the Labour Party’s role in the marriage equality referendum. The “real role of the Labour Party” that Murphy wishes to counterpose to its progressive role in the recent referendum includes support for such liberal measures as marriage equality. But Paul Murphy’s bigger argument is that the decline in opinion poll ratings was due to the absence of visible mass mobilisations around water charges such as the huge demonstrations that started in Dublin and around the State in the last quarter of 2014. There is no doubt some merit in this argument but it is not as strong as it is presented and does not bear the weight he places on it. But he also acknowledges two things which again support Burtenshaw’s argument about the weakness of the Left’s alternative. The first is admission that the role of the leaders of the Right2Water campaign cannot be substituted by the campaigns of the Left, (which calls into question the creation of separate campaigns by the Left groups). So if the decline in poll ratings is at least partly due to the decline in mass protest and the decline in mass protest is at least partly unavoidable this looks very much like another admission of the weakness of the Left alternative. Even with support from the Right2Water leaders a series of mass protests could not continue to have the same effect as the first demonstrations that were such a shock to the political system. Partly this is because the political consciousness of many participants does not go beyond protest politics, involving illusions that the Governing parties will listen, content that they have protested, or simply unable to find a way to turn anger and protest into an alternative. Less importantly, but necessary to learn, the decline is due to the excessive weight put on the tactic of non-payment by some on the Left. This tactic might be helped by regular mass demonstrations of opposition but this is not an absolute requirement. It does not justify a separate campaign with this tactic as its raison d’etre, with its necessary downgrading of creation of a genuine democratic and united campaign that the Right2Water should have been and should still become. So another illustration of weakness is the inability of the Left to effectively challenge the Right2Water leadership to create a genuine democratic campaign. The weight put on the tactic of non-payment can be interpreted to mean that more or less on its own it will deliver victory, so why be so concerned about anything else? But this anything else, as I have noted before, includes the opposition responding to a particular tactic with one of its own such as deducting payment out of incomes. The Government has also responded by major concessions in terms of the amount to be paid. As I have also noted before with the carrot comes the stick and shortly after the carrot came the attempts to criminalise and intimidate opposition activists through arrests. So no tactic by definition is a guarantee of success. The anything else also involves the whole austerity offensive to which non-payment is so clearly not relevant. Cuts in services, unemployment, increases in taxes and wage cuts are not going to be prevented or reversed by non-payment so an anti-austerity campaign that features so heavily on non-payment as the key to success has a big question to answer about how success will be achieved in all the other, bigger areas in which austerity has bitten into workers’ living standards. How if only non-payment works can we fight back in these other areas? The biggest challenge to the Left which the anti-water charges campaign cannot by itself answer is the seeming success of the governing parties in implementing austerity and now being in a position to claim success. The upturn in economic fortunes is real. Unemployment has fallen, the series of major cut-backs has ended and new increases in public spending, cuts in taxation and pay Increases are promised. “Trying to read the poll-on-poll movements against specific political events is always speculative. Fine Gael’s poll decline in the second half of 2014 was as much to do with the controversies surrounding medical cards, penalty points and Garda Ombudsman as it was to do with the politics of water. Indeed middle class discomfort with water charges during 2014 had more to do with the initial charging regime, the handing over of PPS numbers and the excessive costs of Irish Water than with principled opposition to the charges and privatisation. It is not at all clear that the Right2Water mobilisations had any material impact on Fine Gael’s poll numbers or standing with the electorate during 2014. Replacing Shatter and Reilly with Fitzgerald and Varadkar coupled with the impact of job growth and tax cuts on middle class voters is clearly driving the Fine Gael poll recovery. While one can argue that it is very unlikely that the protests had no impact on the polls, it would be hardly deniable that both the polls and the protests flowed from the same anger at austerity and the charges in particular. As I have pointed out before, the fact that there appears a clear way of defeating them, through non-payment, has been a big spur to mobilisation. Finally, there are two other aspects upon which those involved in this debate are not really so very far apart. 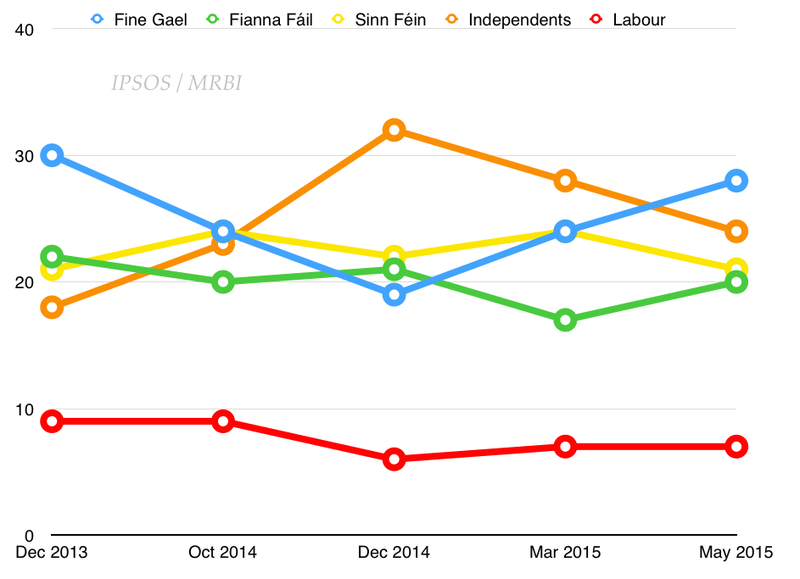 Regardless of the recent movement in the polls, they all note positively the long-term decline in the support levels of the three establishment parties (Fine Gael, Fianna Fail and Labour). Burtenshaw points out that these parties received over 90% of the vote in every election from 1965 to 1989 while he quotes one recent poll that now puts their support at 57%. However the participants to the discussion acknowledge, but refuse to digest, the reality that the majority of the electorate have not broken from the politics that delivered them austerity. The evidence for this is pretty clear – from the 57% figure just quoted, to the election of a Fine Gael Government in 2011, the passing of the austerity referendum in 2012 and the character of much of the opposition to the established parties today. The biggest and most coherent bloc of this opposition is Sinn Fein, which only the politically naïve could believe will oppose austerity in any comprehensive way. The experience in the North is well known to political activists on the Left, while workers supporting Sinn Fein will take it at its word, and will then judge it on its actions. Sinn Fein is no more than a more modern version of the old populist Fianna Fail and neither its nationalism nor its political practice is left wing, never mind socialist. Meanwhile the Left has collapsed its political judgement and political practice into seeking a ‘left’ alternative instead of a socialist one. It moved from an analysis based on some version of socialism to one in which the alternative must be ‘left wing’, to one that is simply termed ‘anti-establishment.’ But much of this anti-establishment vote is not even left-wing never mind imbued with any sort of socialism. No one disputes this, but it rather puts into perspective any illusion of a Left Government after the next election. Burtenshaw is right that the Left needs to be self-critical. The spontaneous outburst of anger that arose in the anti-water charges demonstrations and the organisation of it thereafter will not of itself create the working class movement that is needed. 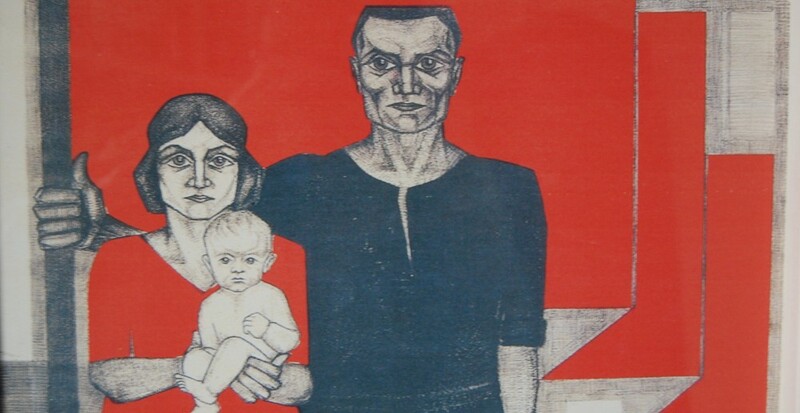 It will not be a question of surfing the wave of working class struggle; not a question of seizing some short term opportunity that will render history the long term weakness of Irish workers’ political consciousness, and it is not a question of what the Left does or does not do before the next election. In the next post I’ll look at the most important aspect in which the contributors to the discussion are more or less agreed – the political programme to be advanced as the solution, whether currently estimated to be convincing and authoritative or not. This entry was posted in Austerity, class struggle, The Left, Water Charges and tagged Austerity, class struggle, the Left, Water Charges by irishmarxism. Bookmark the permalink. The best thought you have had about contemporary politics is that the crisis of socialism is less one about representation and more one about combat or leverage. All of the Irish and British left are obsessed with getting bigger and therefore better representation in Parliament. Sinn Fein are only in the anti-water campaign for as long as there are votes in it for them. The crisis of combat is not even about subjective consciousness it is an objective thing, it is about power understood in terns of leverage. What is the objective state of the power leverage relationship between capital and labour. Well it is massively in favour of capital not least because as you are never done pointing out the State is the guardian of capital. In the last instance, a phrase well crafted by Engels the workers must be armed to tilt the balance against capital and the State. I have no doubt that the republicans in the North of Ireland have lost a good deal of leverage because they decommissioned or surrendered their arms in return for a representation in a token parliament. The only socialist group in Ireland that argued against the decommissioning act was Socialist Democracy. One criticism SD had of the republicans was that they had always opposed the idea that the working class be armed in contra-distinction to their own tiny group. The arming of the working class is not all that makes up the leverage political equation but it is what Machiavelli called ‘necessary’. He argued that an armed Prince is more likely to succeed than is an unarmed Prince. Gramsci said that the party of the working class should act like a Prince. The Syriza government has failed to prepare the workers for armed conflict and this can only mean they are sure to get crushed under the wheel of Capital and its State. In the last instance it comes down to combat and class war. The workers of Ireland and Britain are far from being combat ready this is the real crisis.